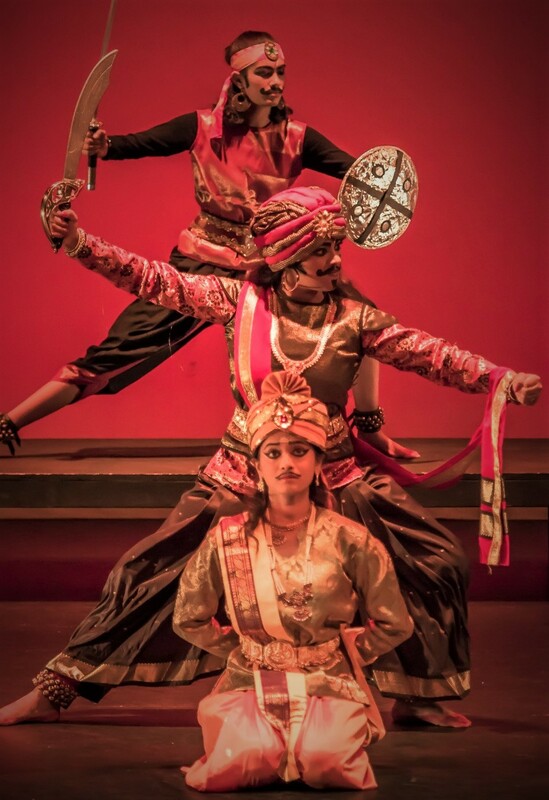 On April 22 and April 23, the Nandini Mandal’s Nandanik Dance Troupe presented Rabidranath Tagore’s dance drama SHYAMAA. The Kelly Strayhorn Auditorium in Pittsburgh was the venue. 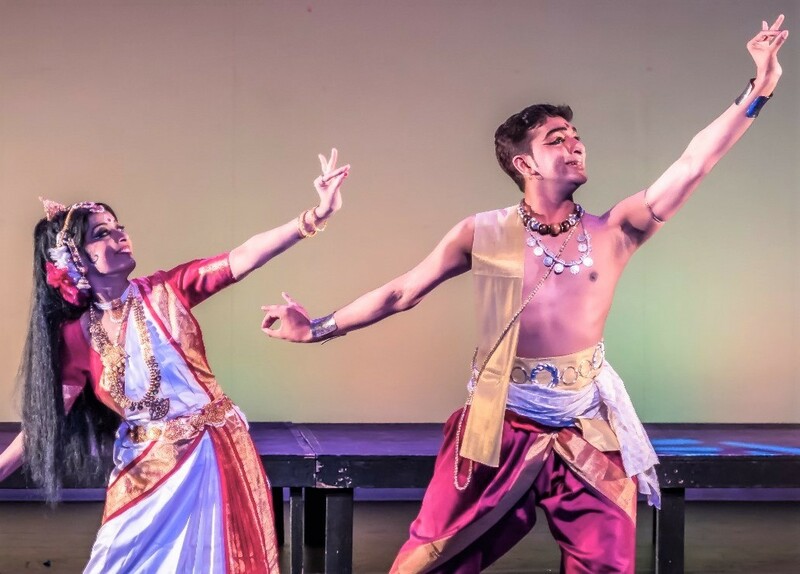 The story revolves around Shyamaa (Nandini Mandal), the court dancer, instantly falling in love with a handsome merchant Bojrosen (the talented dancer Hari Nair from Toronto) from a neighboring country, the moment she sees him. Many men of substance in the kingdom amorously desire the gorgeous Shyamaa. Among them is Uttiyo, a young man in the neighborhood, willing to do anything to please the dancer to draw her attention, even though he has never met her. The drama starts with Bojrosen acquiring Indramonir Haar, a priceless necklace from Suborno Dwip (literally Golden Island). Bajrosen wants to gift the necklace to the bride of his dreams. Meanwhile, there is a theft of jewels from the palace and the queen wants them back. The royal guard, Kotal (played by Kumudini Venkata on Saturday and Paushaly Sau on Sunday) and his men catch Bojrasen. They want the necklace, which Bajrosen refuses to part with. Chased by the royal guards, Bajrosen runs for his life along a river, when he comes across Shyamaa and her friends. Shyamaa’s heart sets on Bojrosen the very moment she sees him. The palace guards arrest Bojrosen. Foisting a false case against him for possessing the invaluable necklace, they plan to execute him. In her desperate attempt to save Bojrosen, Shyamaa lets her admirer, the young Uttiyo (played by Roosa Mandal), take the blame for the theft. Uttiyo is put to death. Shyamaa and Bojrasen leave the country, with the merchant oblivious to how he was saved from imminent death. Love blooms between the two, but Bojrosen is inquisitive about how Shyamaa managed to save him from the clutches of execution. When he keeps on asking her how she secured his release, Shyamaa finally tells Bojrosen what she did because of her love for him, and the sacrifice of Uttiyo. Bojrosen is filled with guilt for Uttiyo’s death, and is disillusioned. He rejects Shyamaa’s love. Having lost Bojrosen’s love, Shyamaa too is disenchanted with life, having been the cause of Uttiyo’s death, Rejected by Bojrosen, she too decides to leave. Bojrosen is left to live in remorse, deprived of love, happiness and peace. Behind the straight story of great tragedy, the story is a metaphor for life itself: the queen and the royal guard Kotal are unhappy not getting what they want, with Uttiyo even dying for Shyamaa. And Shyamaa and Bojrosen, the main characters in the story, also end up very unhappy after getting what they want. Singers are critical for any dance drama. For Shymaa, the foremost exponent of Rabindra Sangeet, Pramita Mullick, from Calcutta, trained in Shanti Niketan, was the female singer, with Agnivo Bandopadhhay of Rabindra Bharati University as her male counterpart. Their well-modulated singing (in audio recordings) of Tagore’s Bengali verses elevated the quality of the dance drama. The main dancers all performed very well, among them Nandini Mandal, Hari Nair, Roosa Mandal as well as Kumudini Vankat and Paushaly Sau. Also, the large number of Nandini’s students — as flower girls and the sakhis, palace guards and others — showed great energy and passion in their roles. Hari Nair, as Bojrosen, nicely brought out the pangs in his heart depicting the sense of guilt for the death of Uttiyo and his inability to forgive Shyamaa for Uttiyo’s death. This entry was posted on July 21, 2017, 12:04 pm and is filed under July 2017, Past issues. You can follow any responses to this entry through RSS 2.0. You can skip to the end and leave a response. Pinging is currently not allowed.